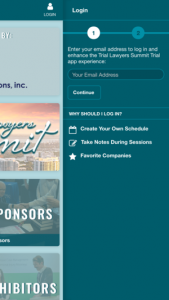 Create your own schedule, network with other attendees, participate in live polls, and make sure you have the most up-to-date event information with the Trial Lawyers Summit App! 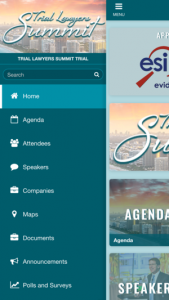 Search the App Store or Google Play Store for NTL Summit, or use the links below to access the event agenda, exhibitor listings, maps, speaker bios, and so much more. Know exactly what’s happening and when. Learn more about the people you meet through their App profiles. Plan your days to the minute with the ‘My Schedule’ feature. Network like a champ and build connections before, during, and after the conference. Navigate the conference easily with full event maps. Venture into South Beach with info about local attractions, dining, and shopping! For the best experience, create a user profile using the same email address that you used at registration. Your user profile gives you full access to all App features and gives you the ability to share as much (or as little) information about yourself as you wish! Upload a photo of yourself, add your professional biography, and instantly communicate with your new connections with just a few taps.